Sweet potatoes are one of the best things about the fall season. Nutrient dense and a rich source of dietary fiber, antioxidants, vitamins, and minerals, sweet potatoes are also packed with flavor. We're here to encourage you to think of sweet potatoes beyond dinner, too. You'll find great main dish and side dish recipes here for sure, but also yummy appetizers, first course ideas, side dishes, and even sweet potato desserts. 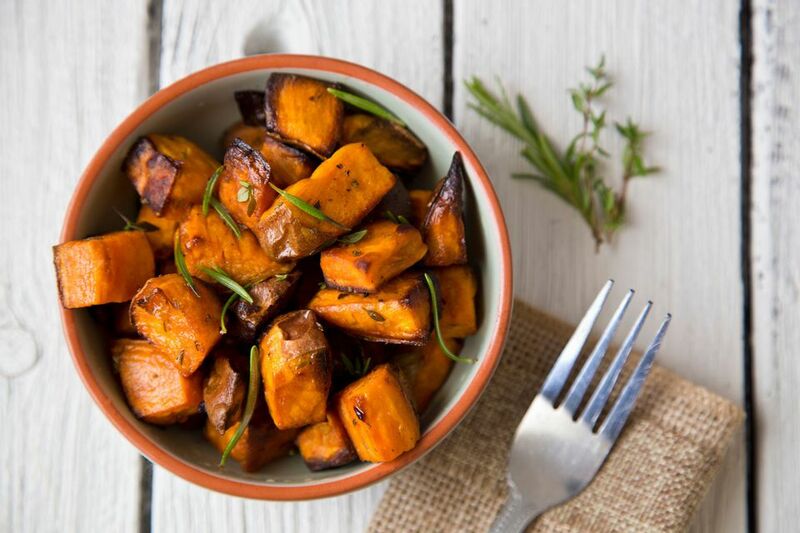 Enjoy the richness and smoothness that sweet potatoes deliver in all of these recipe ideas. 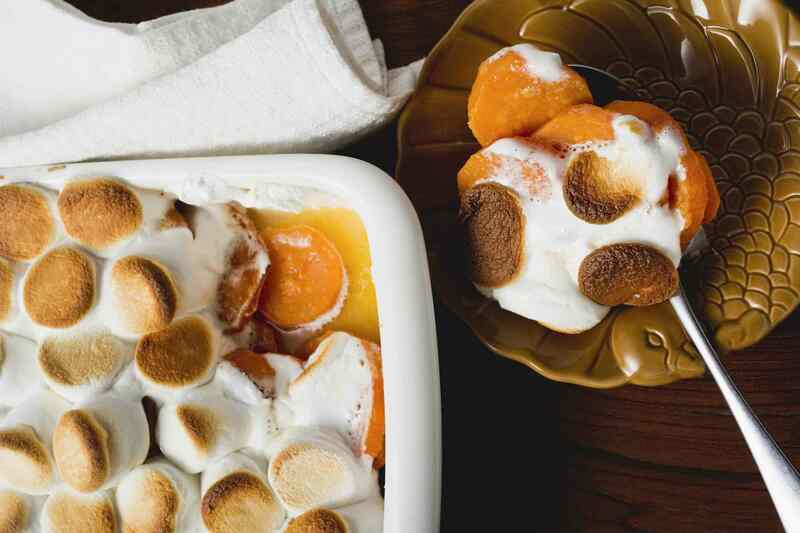 Holiday sweet potatoes with marshmallow topping will wow your family and friends. Mashed sweet potatoes are combined in a delicious casserole with eggs, milk, vanilla, aromatic spices, bourbon, and a mouth-watering toasted marshmallow topping. When you're looking for a nutritious, filling and flavorful hot lunch idea, it would be hard to come up with anything better than this sweet potato and kale soup. Quick and simple to prepare, this healthful, satisfying soup is perfect for lunch anytime (pour some in a thermos for an easy brown bag lunch option), or makes a great first course at dinner. Here's a flavor-packed vegetarian burrito recipe that's sure to leave you feeling satisfied. Mexican-inspired, low-fat, high-fiber burritos are filled with a puree of sweet potatoes, black beans, onions, chilies, garlic, and cilantro, then baked in the oven. Serve this sweet potato and black bean burrito topped with salsa, or sour cream for a tasty treat. Bake this classic Southern Mississippi sweet potato pie when you want to fill your home with the delectable aroma of butter, vanilla, cinnamon, and mashed sweet potatoes. There's nothing like the soft, sweet flavor of this traditional pie that's similar to pumpkin pie, especially at Thanksgiving in the South. Top with whipped cream for a treat. This flavorful, creamy sweet potato risotto with pecans dish cooks in just 30 minutes, making it a great choice for dinner any night of the week, whether you're eating with your family or guests. Savory sweet potatoes, crunchy pecans, and Parmesan cheese combine in a comforting dish. Serve as a side, or make it a satisfying main with a chopped salad and crusty bread. Traditional latkes are made with regular baking potatoes, but why not try something new with these curried sweet potato latkes? Curry powder and sweet potatoes lend a lot of flavor and a touch of heat to these vibrant, Indian food-inspired potato latkes that are perfect as snacks, or for serving at the holidays. They’re great with homemade applesauce and sour cream or try them with mango chutney. Creamy, rich, dense sweet potato cheesecake is a fabulously decadent and satisfying dessert for holiday parties and dinners, but delicious at any time of year. The graham cracker and pecan crust is the perfect base for this yummy cheesecake. This easy to prepare blueberry sweet potato bread is a nicely spiced quick bread that makes a great alternative to the usual banana bread. The vanilla icing is a sweet addition and gives this bread some extra sweetness and flavor. This recipe is perfect for a snack or a special breakfast or brunch. It also freezes well, making it a nice bread to keep on standby for unexpected guests or visitors. A vegan, gluten-free diet doesn't have to mean giving up hearty dinners. This healthful, flavor-packed, protein-rich vegan chili recipe will leave you feeling satisfied. Make this black bean and sweet potato chili recipe for game day parties, or any time that friends gather together. When it comes to flavor and satisfaction, these vegan sweet potato veggie burgers blow other vegetarian burger recipes out of the water. Packed full of healthy ingredients and flavored with maple syrup and pecans, oven-baked sweet potato burgers are truly inspired by Southern cooking. This is a great recipe to use up some leftover cooked or mashed sweet potatoes. Try making this rich, flavorful, gorgeous dip recipe for your next get-together. Roasted sweet potato, almond butter, and fragrant spices combine for a delicious, healthful and vibrantly colorful dip that has a similar texture to hummus. Try this sweet potato dip on crackers or pita chips, or serve as a dip for raw vegetables. This dip can be made up to three days in advance. Nutritious sweet potato falafel is fantastic in a pita pocket, or as part of a Middle Eastern food platter. Yummy baked falafel balls flavored with onion, garlic, parsley, cumin, coriander, and lemon make a great, protein-packed vegetarian meal. Brown sugar candied sweet potatoes cooked in a skillet and glazed to perfection are a somewhat lighter alternative to the traditional sweet potato casserole. You can add a little cinnamon for spiced sweet potatoes, or throw in some pecan halves for a satisfying crunch. Whip up a batch of crowd-pleasing grilled sweet potato fries at your next cook-out party. You can save the oil for something else because these crispy and delicious sweet potato fries are cooked right on the grill. You'll love the taste of a lime vinaigrette that delivers an extra kick of flavor to these fries. Just two simple ingredients are all it takes to create this rich-tasting sweet potato brownie fudge recipe that will have your family begging for more. Store-bought brownie mix and sweet potato puree combine to create gooey fudge bites of dense, dark chocolate squares that are low-calorie and low-guilt.